There was a time when no self-respecting photographer would have been seen dead without a handheld light meter. 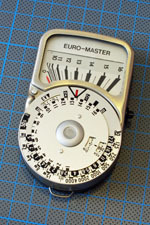 Those times have unfortunately long gone and for the majority of photographers using modern digital SLR's, the handheld meter has been largely superseded by the digital histogram. 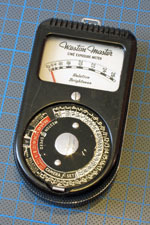 Modern ‘digital’ light meters are still readily available from manufacturers like Gossen and Sekonic but they don’t come cheap. Their capability and complexity however is a world away from the comparative simplicity of the battery free Weston’s and later Sekonic’s I used as a ‘young’ photographer 35 + years ago. 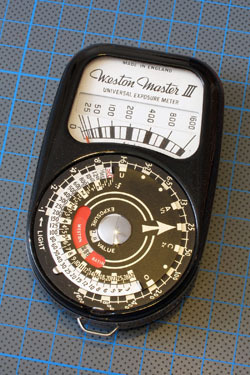 Its sad I know but the Weston Master series of light meters has for whatever reason long fascinated me. I purchased my first, a Sangamo Weston made Euro Master in 1977 from the photographic dealer I first worked for after leaving school. (Lomax’s, St Anne’s Square, Manchester – the old wood panelled shop - lovely!) Back then it seemed to cost a fortune and should really have made an enormous difference to my photography. Unfortunately for this 17 year old at least the subtle differences between reflected and incident light readings were the photographic equivalent of rocket science. As for exposing for shadows or highlights – forget it! I remember it sat in the bottom of the camera bag for a long time rarely used and in absolutely mint condition. I can’t recall what became of it but how I wish I still had it. None of this of course begins to explain why I would have a collection of them – sad isn’t it! 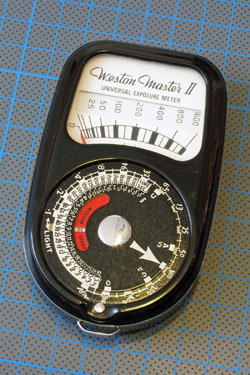 The first of the Weston ‘Master’ series, the Universal Exposure Meter is often referred to as the Weston Master 1. 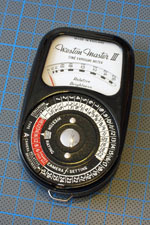 Manufactured from 1939 by Sangamo Weston Ltd at its Enfield factory in Middlesex, the Universal was the first Weston meter produced in an ‘upright’ format. 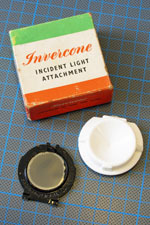 An Invercone with separate neutral density filter was also available which allowed incident light readings to be taken. This also fitted the Mk 11 (below right). The Universal is both large and heavy with a complicated layout in comparison to the rest of the series. A separate Cine version was produced Model S74/720 (below left). 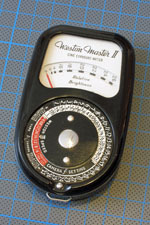 Second in the ‘Master’ series the Weston Master 11 was produced from 1952. 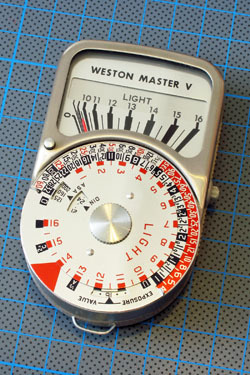 As with the Universal, the Master 11 used the Weston film speed system – the equivalent today of ASA/ISO. A Cine version of the Master 11 was available Model S141/736 (below left). Manufactured by Sangamo Weston Ltd from around 1956. As with the earlier 1 & 11, an Invercone with separate ND filter was also available (below right shows the rear of the Master 111 with Invercone fitted). 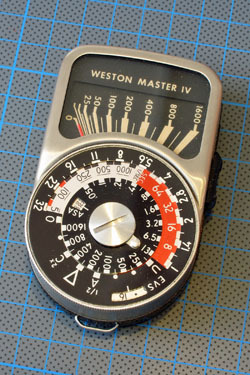 The Mk 111 was the first in the Master series to use the ASA rather than Weston rating system. As with the earlier Models 1 & 11, a separate cine version was manufactured Model S217/-3. 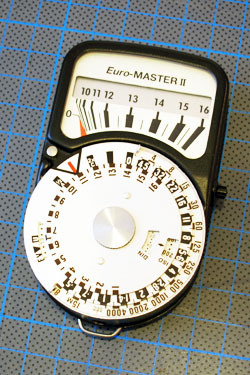 The S217/-3 was destined to be the last Weston Master Cine meter manufactured in the UK (below left). Produced from 1960 by Sangamo Weston Ltd at Enfield. The IV took on the familiar shape and basic configuration the remainder of the series would adopt. 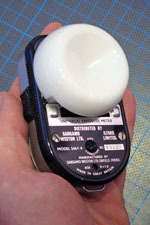 The IV however featured a sliding exposure lock that would only be used on the IV. The IV also did away with the separate ND filter required to use the Invercone on the earlier 1, 11 & 111. The configuration of the Invercone was standardised and any Invercone produced from the IV onwards could be used on any of the remaining Master series (photograph below shows the rear of the 1V with invercone fitted). Fifth in the Master series manufactured from 1963 by Sangamo Weston Ltd. 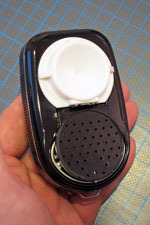 The sliding exposure lock found on the IV was replaced by a simple locking button arrangement that was to be a feature of the remaining series. 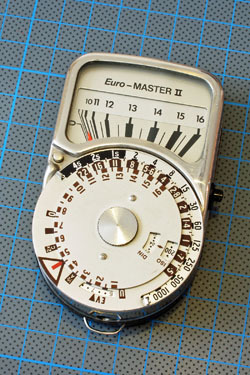 The Weston Euro-Master (right) was manufactured from around 1970 through to 1980. With the demise of Sangamo Weston, a former Sangamo manager John Gahagan set up East Kilbride Instruments to continue manufacture but without the Weston name (below left). Production at East Kilbride continued until October 1985 when East Kilbride Instruments went into liquidation. Manufacture of the Euro Master was then taken over by Tottenham based Megatron but didn’t last long before they introduced an updated model - the Euro-Master 11. 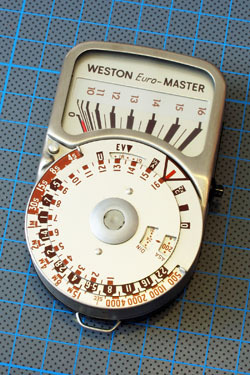 Euro-Masters produced by East Kilbride Instruments & Megatron had the Weston name dropped from the front of the meter and their respective company names on the reverse. 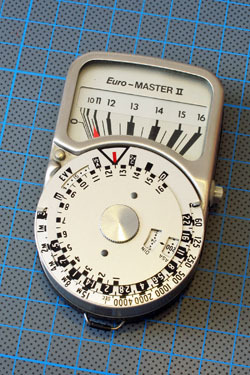 Megatron introduced the Euro-Master 11 (right) in 1985 having initially taken over production of the original Euro-Master using liquidated parts and stock from East Kilbride Instruments. The Euro-Master 11 was destined to be the last in the ‘Master’ series with the exception of two special editions: - the ‘2000 Millennium Chrome’ and quite rare ‘Black Beauty’. The Millennium’ edition (below left) was released for the 2000 Millennium and featured chrome trim around the display housing. Even with chrome trim the Millennium remained virtually indistinguishable from the standard Euro Master 11! It's hard to see in the small photograph below but if you look carefully the upper part of the meter surrounding the display is polished chrome. The other special edition was the so called ‘Black Beauty’. Arguably the best looking Master meter ever made. I’m led to believe it was available by special request and featured a matt black finish around the display housing. I’ve seen references to the ‘Black Beauty’ on a number of occasions but have only ever actually seen one example. Luckily it’s the one now in my collection (below right). Megatron ceased trading in February 2010.